In Downhill From Here: Retirement Insecurity in the Age of Inequality, Katherine Newman advances the conversation about inequality, focusing her attention on the devastating impact that the changing nature of retirement is having on individuals and families, as well as on society and public confidence in institutions. She gives voice to the workers – blue collar and white collar, union and non-union – who, because of a myriad of changes in private and public pension systems, are finding themselves financially unprepared for their retirement. Downhill From Here makes clear that retirement insecurity is another face of the inequality crisis. Retirement insecurity is not a problem for the 1%. A recent study, entitled “A Tale of Two Retirements,” makes clear that CEOs of the very same companies that are walking away from employee pension obligations are putting significant savings into tax deferred plans for themselves and their highly compensated colleagues. Workers, when they have retirement benefits at all, have seen the end of the defined benefit pension plans of a previous generation and the rise of 401K do-it-yourself retirement plans. There is an insidious shift associated with that transition. Workers not only bear far more risk, they – not unlike welfare recipients of the not-too-distant past – are then blamed for not adequately saving for their retirements on their own. One of society’s great success stories had been the decline in poverty among the elderly. That story is changing, and attention is being paid, especially as baby boomers swell those ranks. The stories that Katherine tells in Downhill From Here – of blue collar workers, and white collar managers from large cities and small towns – make the stakes both real and urgent. 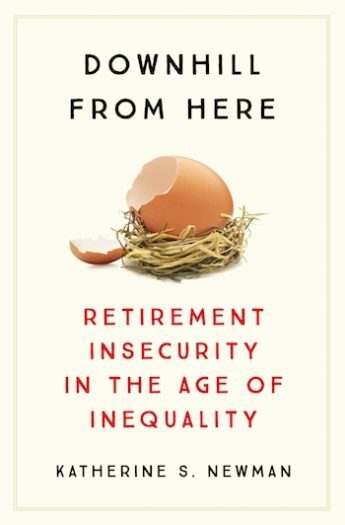 Newman’s compelling portrait of the grim state of retirement security in the United States should serve as a catalyst for major reforms. Newman’s persuasive argument and findings are buttressed with compelling stories. … Newman’s flair for combining individual stories with legal and policy analysis counters the moralizing of behavioral economists who blame human frailty for the rise of financial insecurity among the elderly.